Indigo is an ancient dye and there is evidence for the use of indigo from woad or Indigofera from the third millennium BC, and possibly much earlier for woad. A frequently mentioned example is that of the blue stripes found in the borders of Egyptian linen mummy cloths from around 2400 BC. Several sources claim that ancient linen fabrics dyed blue are likely to have been dyed with indigo because indigo was thought to be superior to woad for dyeing linen. Through many years as a dyer, I have found no difference between woad and indigo for dyeing linen. The truth is that it is difficult to ascertain whether ancient blue textiles were dyed with woad or with indigo from Indigofera. Another example is a cuneiform tablet from 600 BC found in Mesopotamia with a recipe for dyeing wool blue by repeatedly immersing and airing the wool. As Egypt and Mesopotamia are close to Turkey, an area that has many native species of woad, it is probably more likely that the blue dye referred to came from woad rather than Indigofera. The earliest example of indigo from Indigofera probably comes from the Bronze Age Indus Valley Civilization (3300 -1300 BC), also known as the Harappan Civilization. This is the largest known ancient civilization and at its peak may have supported a population of over 5 million inhabitants. 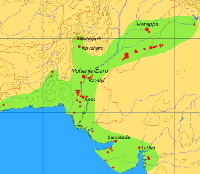 The town of Rojdi (2500 -1700 BC) was the regional centre in what is now Gujarat. When it was excavated, archaeologists recovered seeds from at least 4 different species of the genus Indigofera from the site. Archaeologists also recovered remnants of cloth dyed blue dated to 1750 BC from Mohenjo-Daro (present day district of Larkana, Sindt, Pakistan), another town of the Harappan Civilization. There are at least 50 different species of Indigofera growing in India. In the Northwest region, indigo has been processed into small cakes by peasant producers for many centuries. It was exported through trade routes and reached Europe. Greeks and Romans (300 BC - 400 AD) had small amounts of blue pigment in hard blocks, which they thought was of mineral origin. They considered it a luxury product and used it for paints, medicines and cosmetics. The Greeks called this blue pigment ‘indikon’, meaning a product from India, and this word became indigo in English. Another ancient term for the dye is ‘nili’ from the Sanskrit meaning dark blue from which the Arabic term for blue ‘al-nil’ is derived. This word entered Spanish as anil and later made its way to Central and South America where it is used to refer to indigo. The English word aniline is also derived from anil, and it is used to describe a class of synthetic dyes. In the late 1200s Marco Polo returned from his trips through Asia and described how indigo was not a mineral but in fact was extracted from plants. Small quantities of indigo were available in Europe then, but they were very expensive due to the long land journey required and the levy imposed by traders along the route. Locally grown woad was the main blue dye used in Europe at the time. By the late 15th century Vasco da Gama discovered a sea route to China, allowing indigo to be imported directly. Large scale cultivation of indigo started in India and in the 1600s large quantities of indigo were exported to Europe. The cost of indigo dropped considerably and by the end of the 17th century it had virtually replaced woad in Europe. Indigo was often referred to as Blue Gold as it was an ideal trading commodity; high value, compact and long lasting. By the 19th century, natural indigo production could no longer meet the demands of the clothing industry, and a search for synthetic indigo started. 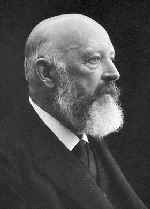 In 1865, Adolf von Baeyer, a German chemist began working on the synthesis of indigo and in 1897 synthetic indigo was launched. In 1905, Baeyer won the Nobel prize in Chemistry for his work on organic dyes including indigo. At the time synthetic indigo was launched, natural indigo production was 19,000 tonnes, and an area of 7,000 square kilometres (a third of the area of Wales) had been dedicated to growing indigo, mainly in India. The much cheaper synthetic indigo quickly superseded natural indigo for commercial dyeing and by 1914 natural indigo production had declined to 1,000 tonnes. Most commercial dyeing now uses synthetic indigo and in 2002 synthetic indigo production was 17,000 tonnes. The world’s current production of natural indigo could not cope with the demand for this dye. However, environmental concerns and an increased demand for natural and sustainable dyes may lead to a resurgence of natural indigo production.